A few news outlets, including Republic, however, continued to dig into the scandal, continually updating their site as more news trickled out, including confessional statements from the arrested nun. 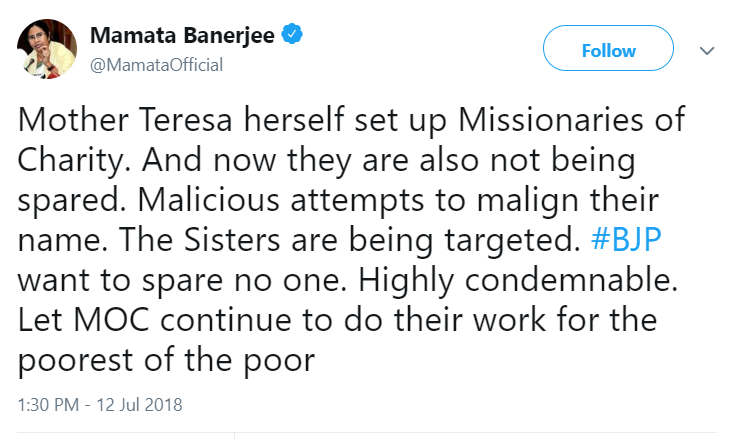 What caught my attention was was the statement by the Missionaries of Charity spokesperson, expressing shock at the trafficking of children that such a line of business would be "against" their "moral conviction" caught my attention. This article, however, is not about this particular episode of child trafficking, alleged or otherwise, by the Mother Teresa founded charity. Let us take a journey decades old. 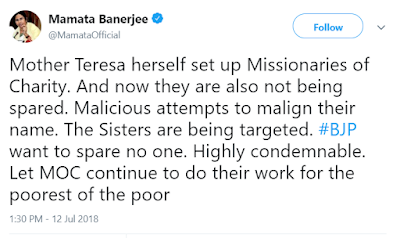 To do that, let us take the assistance of Aroup Chatterjee's meticulously researched book, "Mother Teresa: The Untold Story (which the Irish Independent, Dublin, called ‘Painstakingly recorded, (exposes) the other side of Teresa’), and go back in time to 1980, when a seven-year old Sonaton Dhar was sold to a Belgian Catholic couple for the princely sum of ₹Rs 125,000 (more then two-million rupees - twenty lakh - today after adjusting for inflation). How? Missionaries of Charity falsified records to enable the sale. What exactly were these falsifications? Missionaries of Charity showed Sonaton as an orphan. No, let's correct that - Missionaries of Charity showed all three siblings as orphans. You see, Sonaton Dhar, his two sisters, and mother had been given shelter at Prem Daan - another of Mother Teresa's hospices. Soon enough, the mother died, and all three children were promptly sold off to Belgian Catholics by the nuns at the hospice. This was a crime as per Indian law, since Sonaton's father and grandfather were still alive at the time, and neither had given their permission to the Mother Teresa charity to give away their children for adoption. From 1993 onwards, Sonaton Pauwels (as he was now named) made frequent trips to India to locate his sister. Sonaton visited Prem Daan "many times but was told by nuns to forget his past and move on." Sonaton, with the assistance of some journalists, managed to view his papers at the MC orphanage in 2002, where he found data had been falsified by the missionary outfit - that he was an orphan and that his grandmother had given him up for adoption. Both statements were false. Sonaton continued to investigate similar cases of child trafficking and found 74 such "orphans" only in Belgium. True enough, nothing came from either Sonaton's investigations or from the documentary. No investigation was ordered, no arrests were made, and no charges were ever filed. It was as if Mother Teresa and her outfit could never be accused of child trafficking, evidence be damned. It is not as if Mother Teresa was ever circumspect or apologetic about her priority - proselyting and religious activities came first. The hospices and shelters for the dying were at best a facade, a facilitator, for her main business - religious conversions. To take just one example, in "1974, the Missionaries of Charity (UK) received ￡117,394 in donations. Of that amount, ￡80,000 (68 per cent) they sent to 'H.Q. Rome'; another ￡650 was sent to 'Beda College (Religious Training) Rome'. Child welfare in India got ￡334 and Home for the Dying in Calcutta ￡45." That is, a total of less than one-third of one per cent of the funds received actually went to help the needy and dying. Indeed, in a private talk to some Americans, Mother Teresa gleefully boasted - "Not one has died without receiving a special ticket to St. Peter... Twenty-nine thousand have died in that one house... but it's so beautiful to see those people dying...". More sordid details about the squalid conditions at Mother Teresa's homes has been documented in Aroup's book. What happened if someone did try to investigate or dig deeper into the accounts of Mother Teresa's businesses? When Aroup, in 2001, met Atanu Mukherjee, Registrar of Trusts, Societies, and Non-trading Corporation in Calcutta, he filled an application to view Missionaries of Charity's files of accounts, which were public, and, in theory, open to any member of the public to view. Chatterjee told Aroup of an incident in the 1990s, when a journalist had obtained the accounts of MC and published them. An ocotgenarian Mother Teresa had marched up to the Registrar's office and given him "hell." "The following day, the Registrar got a phone call from some unnamed bigwigs asking him in effect to make the files unavailable to the public." Aroup persisted in trying to obtain access to the public accounts of Missionaries of Charity. In reply to his letter in 2002, the Registrar sent a reply that contained Sister Nirmala's, then head of MC, response, in effect directing the Registrar to deny Aroup any access to the account of MC - "that Chatterjee who has caused us a lot of trouble." One would suppose that a putatively charitable organization would want the whole wide world to know more about their work and how frugally they spent their money and how every rupee, dollar, and pound was spent in the welfare of the dying and the destitute. Obviously, Missionaries of Charity thought differently. As Aroup caustically diagnosed the Indian malaise - "Pusillanimity before the white man is the norm. ... Western vulgarities, such as MTV, have reached remote villages but Western standards of transparency have not touched the biggest institutions." Perhaps the most poignant and pointed illustration of India's continued mental colonization and 'pusillanimity' was on parade for the entire world in 2016, when the government of India sent an official, 12-member delegation, to represent a billion Indians at Mother Teresa's canonization at the Vatican - to honour a person whose mission in life had been to proselyte, convert through deceit tens of thousands of dying, allegedly sell hundreds of babies, deposit hundreds of millions of dollars received in donations in offshore bank accounts, write letters in support of the corrupt, invest not a single rupee in healthcare from those donations for the sick and dying. It has been more than a hundred years since Gurudev Rabindranath Tagore expressed a hope, a desire, a prayer to see his country awaken in a heaven "where the mind is without fear and the head is held high". India has not begun to take even small, tentative steps towards true freedom. This review first appeared in OpIndia on 16th July 2018.